Hello, I recently inherited a Delta table saw from my Father after he passed away; this saw was also owned by his Grand Father. I suspect that the age of this saw is anywhere from 75 to 100 years old! I know for a fact that it is at the very least 40 years old because I remember it from when I was a kid. On one side there is a plate riveted to the housing that has a Serial Number on it (8 2205) and on the other side there are letters and numbers cast directly in the housing (TOS 203). This saw is in almost perfect condition and is totally operational! I was wondering what information you could provide on this model and its age. If need be, I can provide pictures of it, just contact me and let me know where to email them to. Any information you could provide would be GREATLY appreciated! I'm looking for the "front trunnion" for a Delta 1160 table saw - in parts diagrams, ref no 70. Haven't managed to find a supllier who still has one in stock. Could anyone suggest where I could enquire? I also inherited the unit from my late father and would like to repair this fine piece of equipment. I also have a Delta combination table saw and jointer. I inherited it and have been using it for the last 20 years or so. Both the saw and the jointer work great. I suspect that it was originally purchased in about 1940. The only shortcomings for me are lack of portability and unavailability of safety features such as blade guard. I put locking wheels on the legs of the stand so I can at least move it around in my garage, but I have yet to solve the safety problem. Does anyone know of any safety attachments that may be adapted to this saw? I will be posting some pictures of the saw on a separate posting if anyone is interested. If you do see that posting and have any thoughts about exactly when it may have been manufactured or what the current value might be, I would appreciate hearing from you. 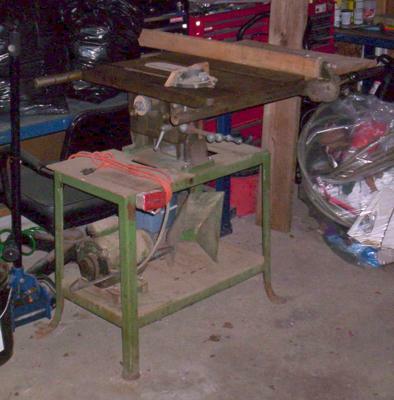 Have a similar saw, including the jointer to the left, powered by a twin shaft motor. This saw has been in our family since the late forties, second rebuild on the motor, and in use everyday in the shop. Have never seen another one like it. John, I have just restored an old saw like yours. Mine is a combo with a six inch jointer on the same table. These saws were made from the latter 30's to the early fifties and can usually be dated by the table. Mine was probably made in the mid forties and has the same table style as yours.